L gets up a 9am for a haircut. Sacrilege. Not just getting up so early on a Saturday without a dog show in the offering but the haircut... In these recession hit times I did try to persuade her that in the interests of austerity she should postpone her trip to the hairdressers to save money but it wasn’t to be. The boys and I lay in. In the evening we’re at Broadway, where we have to renew our membership. This doesn’t come cheap but is usually worth it. The director David O Russell has produced two of the best films of recent times in the 'The Fighter' and 'Silver Linings Playbook'. 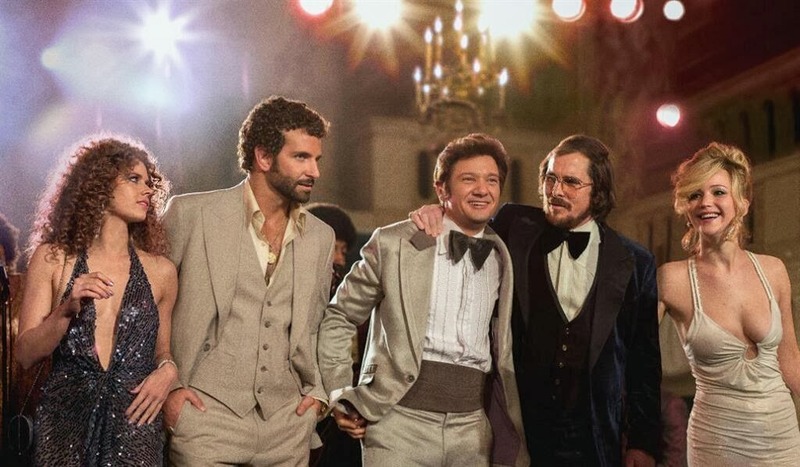 He must have been happy with the performances he got from his cast in those films because for his latest ‘American Hustle’ he seems to have merged his lead actors and actresses from those two films. American Hustle is set in the late 70's or perhaps the early 80's and features seasoned con man Irving Rosenfeld (an unrecognisable Christian Bale), a man with a really bad comb-over. Along with his con lady and lover Sydney Prosser (Amy Adams), he cons the desperate men who come to him for loans. Unfortunately they get caught out by FBI agent Richie DiMaso (Bradley Cooper). DiMaso offers them a choice of jail or collaboration. He wants their assistance in taking down a host corrupt congressmen and casino barons. They agree, reluctantly. Their way in is though the mayor Carmine Polito (Jeremy Renner), although ‘Irv’ feels uneasy about conning a man he soon develops a good friendship with. He has another problem as well, namely his loose cannon of a wife Rosalyn (the delightful Jennifer Lawrence). There’s not much love between them but they stay together, loosely speaking, for the sake of their son. She appears highly likely to blow their cover at any point and eventually does. The plot is loosely based on the Abscam scandal and is great fun through although possibly hard to follow at times basically because there’s an awful lot going on. There are plethora of plot twists and turns amongst the back stabbing, double dealing etc but even if you can’t follow the story, sit back and enjoy the characters. The film delivers a wonderful array of personalities delivered with some very fine acting. A lot of the audience seemed to find the whole film LOL funny. I didn't think that, a few smiles maybe and Amy Adams’ dress raised a chuckle or two, in a neckline plunging to the floor sort of way. Not a perfect film but impressive enough I’m sure to bag a few awards this year.